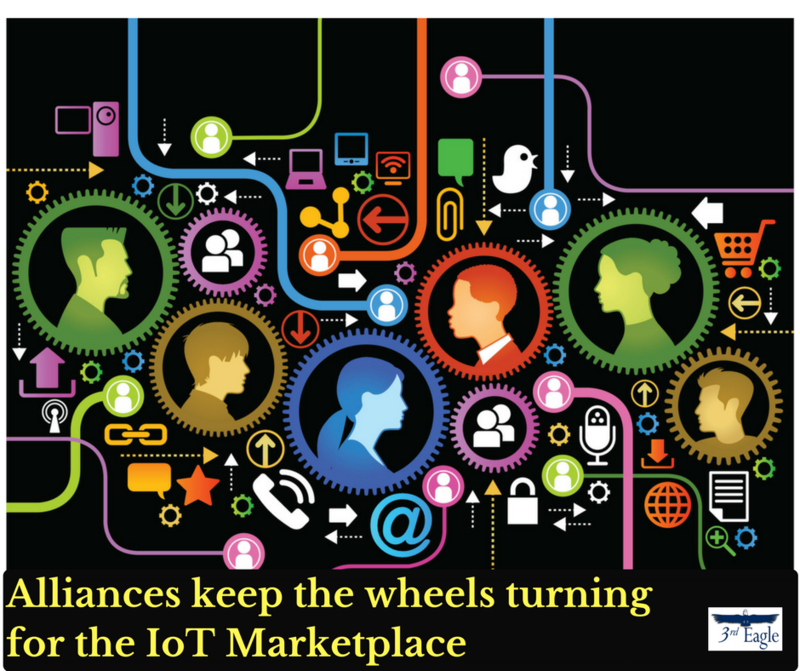 Why Alliances for IoT Marketplace Success? Creating alliances between companies involved in the IoT, (Internet of Things), can be tricky at times, but a requirement for entry into this marketplace. The cold hard truth is that the IoT will not be able to survive if companies don’t create alliances between each other. There is not a single company that can provide all pieces of an IoT solution. It is very important that those involved in the IoT create partnerships. Keep in mind exactly what we’re doing here. We are creating partnerships to further others and ourselves. You may provide a piece of the solution, but other companies must provide the rest of the solution. The result is profit for everybody; this is the only way to keep the IoT relevant and prosperous. Because creating partnerships is so essential, it is important to know what to look for in a partnership, what you bring to a partnership, and what to expect from a partnership. This is continual monitoring and review of the relationships between the players. Say you are a company that creates operating systems for cellphones, obviously your product is completely irrelevant without cellphones to use your operating system! This is an example of a symbiotic relationship. Cellphone companies need operating systems, and operating systems need cellphones. Then there are alliances with all the companies that write apps for the phones using that operating system. It is important to maintain your relationships with your alliances. As time goes on, more and more products are needed, and the advancement of modern products will keep progressing. Keep in mind what you are bringing to the alliance and what you are getting from the alliance. It is a matter of fact that the longer the relationship lasts, the more successful it will be, so try to work with each other and adapt to keep the relationship happy and healthy. Where can you find advice on building and maintaining business relationships? 3rd Eagle specializes in creating and supporting partnerships for all those involved in the Internet of Things. For more information on building and maintaining healthy business alliances contact us here. This entry was posted in Collaboration, Internet of Things, Partnership, Strategic Alliances and tagged alliances, Internet of Things, IoT, strategic alliances, working together by GeorgeTyler. Bookmark the permalink.